Home / Roses / Opening of the first one! Opening of the first one! This time of year, to me is very special. I love the starting of life that this time of year brings, whether it’s the bright fresh green foliage at is now covering the countryside, in all its different shades of green or the sound of young hatched birds squeaking in their nest. For me it is the real time of change, spring becomes early summer and there’s 3 things that to me, herald in the start of summer, the first is the swallows arriving back from Africa, with their chatter filling the gardens with joy, next is the ear drum bursting sound of screeching as the swifts appear once more over ahead. Their short term stay is far too short but to me is the true sound of summer. The last thing for me is the opening of the first rose in my own garden, yes I have seen a few early roses out in other peoples garden it the opening of the first rose in my own garden is always a special occasion and that final part of the summer jigsaw arrived for me yesterday with the opening of a very special rose! We came back home yesterday after a day at the seaside, to be welcomed in by Climbing Lady Hillingdon flowering away in our back garden. She is always an early rose but it is a rose I have long loved and it has been a special rose in our family, for it was this rose that brought about my dads love of roses back in the 70’s and one that has been grown in every family garden since, including mine now in chandlers ford. For those who don’t know her, here’s a blog from last year Climbing lady Hillingdon that dwells on her history. 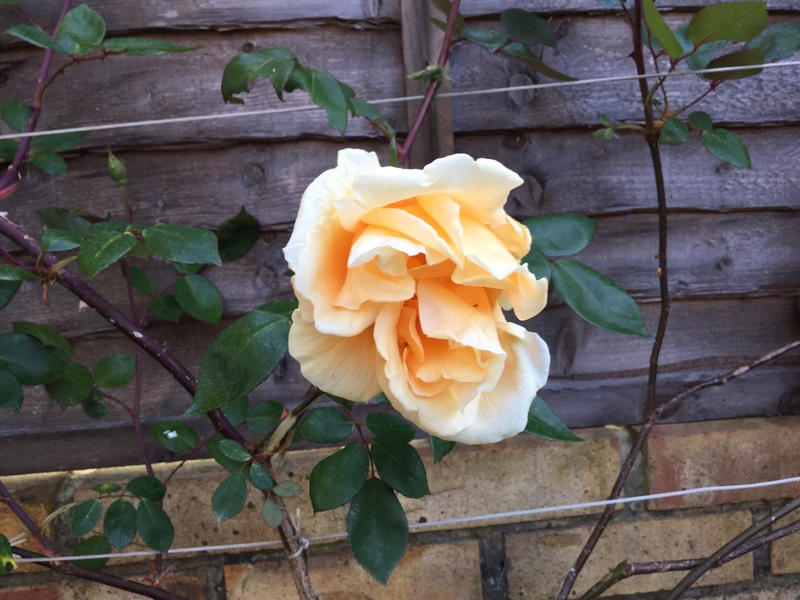 She is one of the finest apricot roses you can grow and it was wonderful to have her lady ship welcome in the summer by adding the last piece of the jigsaw to my summer jigsaw. Now at last, the rose season will start up once more and the scented delights will fill our gardens with colour and scent once more. Snap. My first opened yesterday too – Wild Edric. Rather a shocking pink. Today, I have several blooms. When Edric gets going he goes Wild. 😉 Is her ladyship’s first bloom like the later ones (as is Edric’s)? With some roses, for some reason, the first bloom looks different – my Rhapsody in Blue’s first is always single; after that it goes properly semi-double. Some of the roses I work with are right outside, and they are in their second phase. I am pleased that they are so prolific now. Mine are not so colorful the second time around. I’m still waiting for my roses. They are very behind but we have buds! That Rose is gorgeous.